South Africa is one of the rising markets for U.S. variety meats. The U.S. Meat Export Federation is working to keep it that way. South Africa reopened to U.S. beef in 2016 and quickly emerged as a promising market, especially for beef variety meat. From January through July, U.S. beef variety meat exports to South Africa – primarily livers – totaled 9,175 metric tons, up 284% year-over-year, valued at just over $7 million, up 368%. 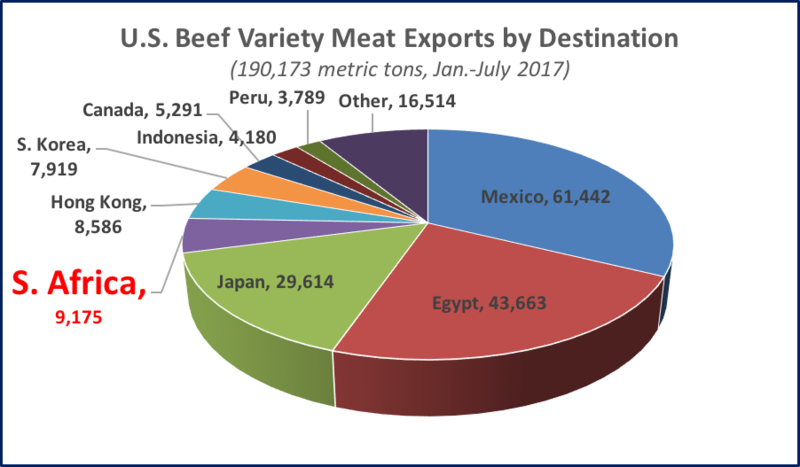 With this exceptional growth, South Africa is already the fourth-largest volume destination for U.S. beef variety meat exports this year – trailing only Mexico, Egypt and Japan. On a global basis, January-July exports of U.S. beef variety meat totaled 190,173 metric tons valued at $505.4 million – up 2% and 3%, respectively, from a year ago. 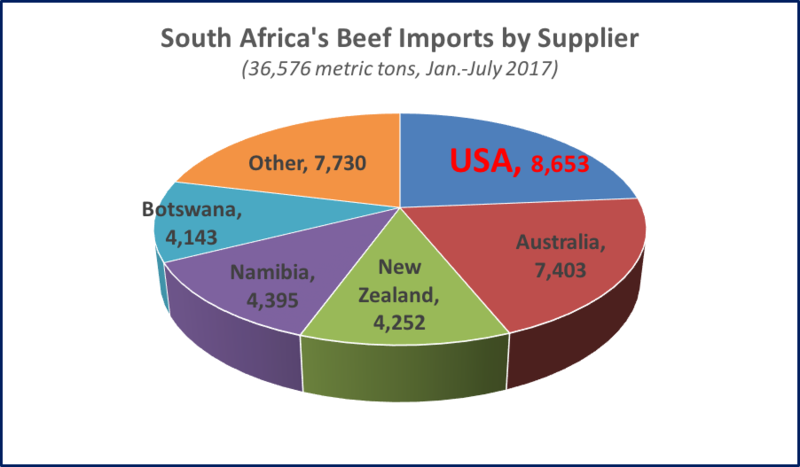 The United States is South Africa’s largest total beef supplier in 2017. Through July, The U.S. captured 24% of the imported beef and beef variety meat market in South Africa – up from just 4% last year and surpassing Australia (20%), New Zealand (12%), and neighboring countries Namibia (12%) and Botswana (11%). For beef variety meat only, the U.S. holds 32% market share in South Africa. One of the key benefits of gaining access to the South African market is that it has helped the U.S. beef industry diversify its export destinations for beef livers. While Egypt remains our largest liver market, demand is more volatile than in years past due to difficult economic conditions and weakening of the Egyptian currency. These circumstances, along with the prolonged closure of the Russian market, have hastened the U.S. beef industry’s efforts to develop alternative markets for U.S. livers in Africa, Latin America and Southeast Asia. In 2013, following Russia’s closure to U.S. beef, the percentage of U.S. liver exports going to Egypt climbed to 77% – up from 58% in 2012. This percentage peaked in 2015 at 82%, but dropped to 74% last year and has declined to 62% through July 2017. South Africa has taken 17% of U.S. liver exports so far this year. In an effort to gontinue growing the South African market, the U.S. Meat Export Federation (USMEF) recently welcomed a team of seven meat buyers from South Africa to the United States. The group had one-on-one meetings with U.S. suppliers and a firsthand look at U.S. beef and pork production and processing. The buyers were accompanied by Monty Brown, USMEF representative in Africa and Europe. The team’s activities were funded through support from the beef and pork checkoffs. At a farm visit organized by the Iowa Beef Industry Council and the Linn County Cattlemen’s Association, the South African buyer team toured a cow-calf operation at the Neal and Jennifer Horning farm near Marion, Iowa, which the Hornings operate in partnership with Dave Roll. The group also toured the FPL Food beef processing plant in Augusta, Georgia. While in Georgia, the buyers gathered for dinner with representatives of USMEF companies to learn more about the attributes and availability of U.S. red meat products. The group also had opportunities to visit a variety of retail outlets while in the United States, focusing on portioning, packaging and merchandising of U.S. meat products and trends in consumer demand. Joe Schuele is vice president, communications, with the U.S. Meat Export Federation in Denver, Colo. Beef import vs. export values. Where does the U.S. stand?